Take care of the details and the rest will take care of itself – this applies just as much to event organising as anything else. And especially so when it comes to tableware. As much as ambiance and furniture, event tableware can help to define the atmosphere of an occasion, as well as the experience that guests have. No matter what the type of event you’re organising there will be tableware to match – so, how do you choose it? Any area of aesthetics is influenced by themes, including event tableware. Currently, we are seeing a move towards bowl eating and food that is consumed in a more relaxed way. 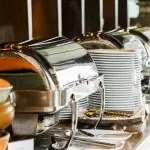 Lots of cutlery and crockery and a confusing set of glassware for each course is much less popular as an option for presenting event catering. Vintage remains a strong influence, especially as a way of adding character to a table design. Plus, given the importance of gaining traction on social media, many event organisers are starting to look for statement tableware that is worth a tweet. Tableware can have a big impact on the overall look and feel of an event, which is why it’s such a crucial component to consider. If you’re keen to create an atmosphere that is low key and minimal, plain white tableware in simple but elegant designs will be ideal. If the tableware needs to support a theme – such as rustic or vintage – then it’s a good idea to select pieces that have a little more character. While you can choose to use the tableware to make a statement, if you’re not entirely sure about how you want to use it, the easiest option is often to opt for simplicity. It’s not just the aesthetics that you need to consider when it comes to tableware but the practical requirements too. If you are having a range of courses then you’ll need cutlery and crockery for each. Glassware requirements might include water glasses, as well as options for red and white wine. Then there are coffee cups, side plates and any additional serving dishes that the menu might make necessary. Although you don’t have to channel the same style across all of your tableware, it is a good idea to ensure that quality standards are the same. High end glassware with low end crockery can look incongruous, for example. Especially if you’re looking to make an impact with your table design, glassware is an essential component. Striking modern pieces can bring a sense of style and complete a high end aesthetic. Glassware is a great way to reinforce a theme or to express a little personality if the rest of the tableware is fairly minimal and pared back. If you’re looking to hire the perfect tableware for your event we can help – contact us to discuss your requirements.